It’s one thing to start up a poetry journal, quite another to keep it coming for decades. With the October 2015 issue, Blue Unicorn, published in Kensington near Berkeley, California, approaches its fortieth year; I’ve been an editor for a third of that run. Every cover–over 100 so far–has featured a piece of unicorn art chosen by founding editor Ruth Iodice. 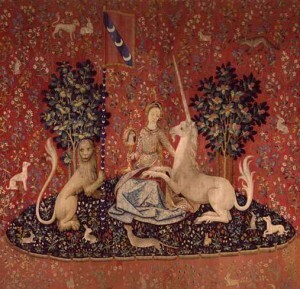 This time it’s one of the medieval “Lady and the Unicorn” tapestries, known to many through Rainer Maria Rilke’s description in The Notebooks of Malte Laurids Brigge. Some 30 poets, well-known or deserving to be, have poems in the issue, including Therese Arcenaux, Joan Colby, Michael Cadnum, Sally Cook, Ruth Daniell, Daniel J. Langton, Paul Malamud, Fred Ostrander, Oliver Rice, Judith Saunders, Joseph Salemi. I chime in on the Rilke theme with a translation from his Sonnets to Orpheus.